This an extra recipe with the Medieval coloured easter Eggs. During Lent, between carnival and Easter, no eggs were eaten. But sometimes eggs did appear on the table, as a joke. These were mock eggs, made with pike roe (also eggs, but from fish, so these were permitted) or almond milk. Here is the version with almond milk, from the first volume of the Middle Dutch convolute KANTL 15.1. What you see is an egg, what you taste is almond pudding with a crunchy stuffing. To prepare this dish the cook had to look ahead, because hens do not lay eggs during winter. At least, not if you do not force them to continue laying eggs with artificial light. So sometime during summer or autumn cooks’ helps must have cracked the eggs for omelettes with extra care to keep the empty shells for Lent. 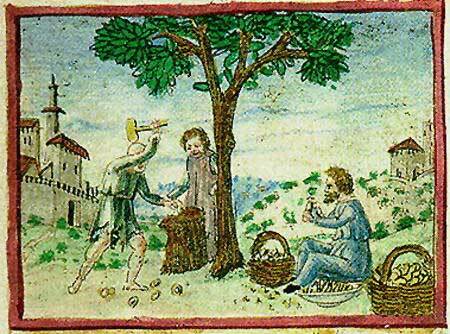 Because the mock eggs are made from almonds, you see a picture of an almond tree from the Viennese Tacuinum Sanitatis (Health Table). As you can see, it is not easy to deshell almonds! In medieval health theories almonds were considered to be very healthy, because they had about the same qualities as a healthy human. In view of modern dietetics almonds are healthy as well. They are very nutritious (which is not necessarily an advantage), and contain a lot of calcium. That was in hindsight of course a great advantage during Lent when all dairy products were banned. Indeed, for those who could afford them, almonds were used as milk, butter and cheese (almond milk, almond butter, almond cheese). So the recipe is from the Gent convolute KANTL 15.1 (edition Braekman, recipe# 73, page 20, see bibliography). The edition from 1986 is hard to find On my site the first volume has been published along with translations in modern English and Dutch, volume 2 is in progress, volumes 3 and 4 are still to follow. The person who wrote this recipe had a very untidy hand. By the way, my own hand isn’t that much better. But I can’t decide whether the eggs are stabilized in sand (sant) or salt (saut). Both are possible, in practice as well as compared to the rest of this handwriting. I’m not asking your opinion, just wanted to show you this little picture so you can see my problem. For those of you who are not familiar with old writing hands, the first letter is not an f but an old-fashioned, long s. Just as in modern writing, the letter f had a little cross line. nempt een huijsen blat ende slaet die ontstucken ende wasset die stucken daer nae doetse in enen erden pot met enen moeskumken waters ende laetse daer in ouer dat vijer smelten dijt seldij dan menghen met alsoe woel ameldel molcks ghesoden hier in seldij vat wijt sucars doen dan seldij dijt ghijeten in ideleen doppen om trent die half vander doppen dan seldij nemen amandellen cleijn ghestoten ende weruense met vat soffranis ende maekt daer af harden doyeren ende dan steckse in die eyeren eer dat wijt al stijf is ende daer bouen op seldij die vorsijde wijtte stof ghijeten die doppen al wol ende die doppen sellen eyndelijngh ghestan int sant [of saut?] opdat sij wast staen moghen als ghij wijlt ende als dan die spijse in die doppen qaut is soe moghen die eyeren dijenen. To make eggs during Lent. Take isinglass (sound or swimming bladder of a fish) and pound it to pieces. Then wash the pieces, put them in an earthenware pot with a small bowlful of water and let them melt tin it over the fire. Then temper it with just as much boiled almond milk. In this you shall put some white sugar, then you pour it in empty eggshells till half full. Then you shall take finely ground almonds, colour them with some saffron, and shape into hard[boiled] egg yolks. Then push them into the eggs before the white has coagulated completely. And on top of this you shall pour the afore mentioned white mixture [until] the egg shells are completely filled. The egg shells shall stand straight up in the salt [or sand?] to have them standing firmly whilst you fill them up [or if you want to?]. And when the stuffing in the egg shells is cold, the eggs may be served. Instead of isinglass, which is hard to come by, you could also use ordinary gelatine, but mind that this is made with animal bones, so strictly speaking not permitted during Lent. A vegetarian alternative could be agar-agar which is made from seaweed, but that is not very medieval. Dessert or snack for 4 persons; preparation in advance 35 minutes; preparation 90 minutes including waiting to let the jelly set. Egg shells – Break 4 eggs as straight as possible at two thirds of the shell. Catch the raw egg in a bowl, use the eggs to prepare an omelette or something like that. Rince the egg shells, drain them. Take care to keep the two parts of one shell together, or you’ll have quite a puzzle later on. Prepare almond milk – Ground the blanched almonds in a blender, or use ready-bought ground almonds. Add the water that has boiled but is slightly cooled, and blend some more. Leave it for 30 minutes. Strain the almond milk through a fine-meshed sieve. The liquid is almond milk, the ground almonds left in the sieve can be used for the fake yolk. You’ll get about one cup almond milk. Prepare the ‘yolks’ – For the yolks you use the ground almonds that were used preparing the almond milk. Put them in a bowl with a teaspoon sugar. Crush the saffron in 1/2 tablespoon hot water, add to the ground almonds and mix well. Stuff the egg shells – Place the eggs upright in an egg carton, or do it the medieval way by using sand or salt to stabilize the eggs. Pour the cooling almond milk into the shells to about halfway up. Wait for half an hour until the milk has coagulated. Form little balls of the ground almonds and gently drop these in the shells. Heat the remaining almond milk again until just melted, fill the shells to the rim. Wait another half hour. Now fill the caps of the shells with the remaining coagulated almond milk and gently press cap and shell together in such a way that they fit exactly. Excessive ‘ eggwhite’ will be pressed out, wipe away with kitchen towels. Let the eggs cool completely, preferably in the refrigerator. Put the ‘cooked eggs’ in egg cups and serve them. You can eat them just like real eggs: take off the top and spoon out the content. You can also first peel the eggs completely. In a modern menu these sweet almond eggs are a dessert. In the medieval menu they would be served along with the fish. According to the original recipe. 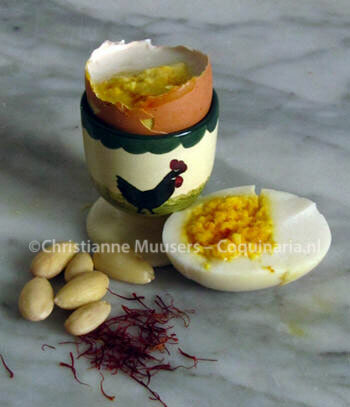 the ‘yolk’ is made only with coloured, ground almonds. But when you use yellow coloured marzipan, you get a real treat! The link is for eighteenth-century marzipan with cream, but you can use anyy other recipe instead, or use ready bought marzipan. When peeling the almond eggs, be more gentle than you would peeling an ordinary boiled egg. The almond jelly has not coagulated all in one go, and can separate easily between the diffferent layers. As one of its names indicates, this is the fishy version of gelatine. The name isenglass is thought to be a corruption of the Dutch huisenblas, which means the gas bladder of the sturgeon. Isinglas is indeed made from the gas bladder of the sturgeon, but also of other fish. If you wonder what a gas bladder is, look here. The gas bladder is cleaned and dried, then the outer membrane can be peeled away. The membrane will be cut into strips. Isinglass has to be dissolved in boiling water. That will take about thirty minutes. It takes 35 gram isinglass to make 1 liter jelly. The culinary use of isinglass is very old, it is mentioned in medieval cook books (as in this recipe). Isinglass is expensive, but it can still be bought. Hobby brewers still use it to clarify their wine or ale.